Young marksman is also being chased by Liverpool. 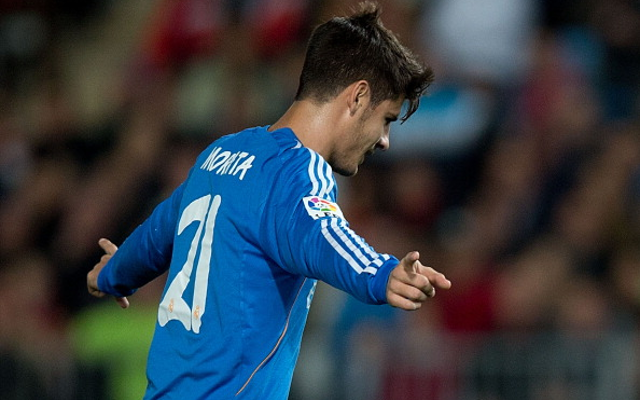 Arsenal’s planned loan move for coveted Real Madrid front man Alvaro Morata is in danger of collapsing after los Blancos head coach Carlo Ancelotti had a late change of heart regarding the Spaniard. The north London club have been heavily linked with the Spain Under-21 international of late, with many media organisations even claiming that Gunners head coach Arsene Wenger had already agreed to take Morata on a six-month loan deal now that the winter transfer window has finally opened again for business for the season. In fact, it had been thought that all that the Frenchman now needed to do was agree a loan fee with the La Liga giants for Morta – thought to be somewhere in the region of £1.7m – for the move to take place. However, those stories now appear to have jumped the gun after Madrid boss Ancelotti seemingly had a late change of heart regarding the striker and just how big a role he may play up front for Madrid in the second half of this campaign. So far in this season, Morata has featured in a total of 15 matches under the Italian trainer, hitting the back of the net on two occasions and registering an assist in the process as well, with both of those strikes coming in one of the player’s ten La Liga outings for the club. And as Madrid’s recent good form in the league continues and the Spaniards’ now get closer to arch rivals FC Barcelona at the top of the table – Real currently trail the Catalans by just three points now – Ancelotti has decided that he wants as many attacking options available to him as possible between now and the end of the campaign. All of which means that Morata will now be staying at the Santiago Bernabeu this month after all rather than moving to north London, news which will come as a huge blow to Arsenal boss Wenger as he looks to maintain his club’s slender advantage at the top of the Premier League. The Frenchman had wanted his own back-up options up front for France international Olivier Giroud, who recently went down with an ankle injury, while fellow attackers Nicklas Bednter and Theo Walcott are also currently suffering from long-term knocks too. meaning that Wenger will now have to look elsewhere for a new forward in January.